I come from a long line of Tennessee hillbillies …er…Appalachian Americans. My grandparents on my father’s side, Charity Grace Rupard and William “Stone” Rupard, were subsistence farmers who owned land in a holler (hollow) in Laurel Bloomery, Tennessee. Where’s that? As my uncle Claude would say, “It’s right down the dirt road past the forge outside of town, which is a skip from the highway to Mountain City, oe’r the mountain from Johnson City, not far from Bristol.” People generally started nodding recognition when he got to “Bristol” – but Claude talked like a country boy – so it took him nearly 5 minutes to get there. Charity and Stone had eight children, of which my dad was the “last boy.” His little sister Carrie came three years after he did and stole “youngest” right out of his hands. Sandwiched between two girls - “Baby Carrie” (they called her that until she died in her 70’s) and Cettie, the oldest of the bunch, were 6 tall, blonde, strapping boys. The small farm held plenty of work to keep those many hands busy and mouths fed. They grew tobacco to generate income for the land taxes, and made just enough moonshine…er…home-crafted-corn-mash-drink…to make money for clothes and shoes (worn in winter only). The rest of the farm, animals, and land existed just to feed them. My dad and two of his brothers left to fight in World War II. When the war ended the other two went back to the farm but my dad had begun a journey that would take him to another world – the “city life” (as they called it with no small amount of disgust…er…rightful concern). My experiences on the farm were summertime affairs where I’d be dropped off at Mamaw’s and my dad would go back to work and my mom would go visit “her people” (city folk!) for the summer months. Stone died the year before I was born, but Charity Grace ran her family, now grown and branched off into their own houses around the holler, with the memory of Stone’s iron will and her own brand of practical love. Don’t think they were lazy summer days. They were filled with chores, and some chores, more chores, and just when I sat down at night and pulled out one of the books my mom packed for to read – guess what? Dishes needed done, laundry could use a “run through the ringer” (yes, she had one of those ringers with the crank that promised to flatten me like a flapjack if I wasn’t paying attention) and some chore called. Only when my grandmother would tell me to “cut the light” (the word “light” had 3 syllables when she said it) would I get rest. I loved every minute there and I’d give almost anything I own to go back, if only for a sunny afternoon (with chores). In Buddhism, we are taught a lot about compassion. It is the heart of the Buddha; it is the passion of the practice. It is our best selves, our real selves, and although time, tide, words, and wounds can make it hard to access, it is always there for us to reclaim. But, what is it, really? Recently, someone challenged my ideas about compasion in a way that led me to do some meditative soul seeking. 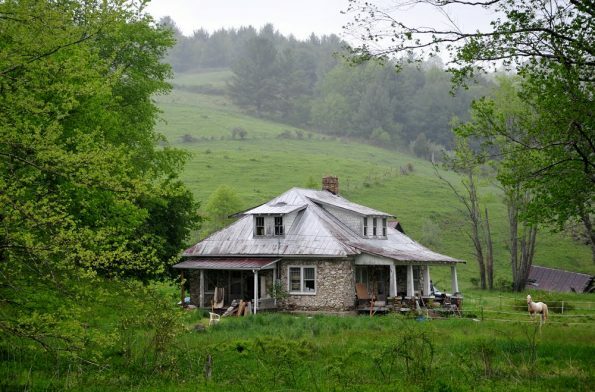 I didn’t come up with many answers (cushion time is almost never about answers), but I realized everything I needed to understand about what compassion is (and what it is not) could be found in that little farmhouse built into the side of a mountain. Does compassion deny consequence, personal responsibility or natural law? Is there only one “compassionate answer” to a situation? Is compassion what you do or who you are? Although I never met Stone, his legacy was branded into his children with surety and strength. He was, by all accounts, a good man, but a stern one. Rules were rules, and if you crossed them you paid the price. If you broke it, you fixed it. If you couldn’t fix it, you figured out how to live without it. No playing in the outhouse…er…external unisex potty facility, and no animals inside the house (that means you, barn cat!). I remember one time my Uncle Luther had a wounded bunny he was nursing back to health at his house down the way and he was whispering to me to come by so I could see it. My grandmother, whose supersonic hearing lasted well into her 90’s, entered the conversation with a bang. “Yes, Ma’am,” he said, and winked at me, pointing toward his home. Now – these were two men, in their late 40’s with homes of their own, whose father had been dead for at least ten years, and they were still emotionally subject to his rules. However, when you think of what it must have taken to raise eight kids on a small farm with no government help, little social support, and lots of praying about the weather – his attitudes probably kept the family from starvation, ruin, or loss. On the other side was Charity. She could be just as strict, but she’d smile at you as soon as chide you, and if something left you feeling on the outs – she’d mistakenly cut an extra-large piece of cornbread just for you. When the day was settled, she’d sit on the porch or in the front room, listening to the radio and sewing quilts from cloth remnants everyone in the valley brought her. She had a sewing machine for repairing work pants and flannel shirts – but the quilts were a labor of love, hand sewn. When she’d finish a few she’d ask Luther or his wife to take them to the county fire department, in case someone lost their home to fire or flood and needed a warm blanket. Not long after her 90th birthday (she died at 96) someone from the fire department showed up on the farm one day and asked to take her picture. Seems they’d been keeping count. The last quilt she gave them was number 250. Let that sink in. A woman who had probably never handled more than a hundred dollars “cash money” in her whole life, hand-made 250 quilts for people with far more than she ever would have - in case they ever found themselves having less. Reflecting on this couple who shed the seeds to me, the blurry view of compassion I’d been lamenting became much clearer to view. Compassion is not the Action. Compassion is helping and helpful; connecting and collective. It’s the fuel that takes us to happiness, and allows others to find the path to their happiness too. Compassion is seeing. Compassion is opening. Compassion is allowing. For me, after all the thinking, reminiscing, and cushion clarity, I have found the middle way in my thinking on compassion – it is reasonable, and it is magical; it is strong enough to support and flexible enough to allow; it is somewhere between Charity and Stone. Compassion is part of all of us. It's our choice how to reach it and what to do with it. Compassion is a fuel that will take you anywhere worth visiting. Compassion and action are like peanut butter and chocolate - you can have each one separately, but they are better together. Posted in Buddhist Basics, Compassion, Family, Memory, Middle Way and tagged Buddhism, Compassion, Country life, Healthy Buddhism, Middle Way, Wisdom.